Preheat the oven to 400F and heat the oil in a large skillet. In the skillet, sauté the chorizo, onion, jalepeno and garlic over medium heat until chorizo is cooked (about 5-10 minutes). Add the rice, corn, stock, wine and water and bring to a boil, then reduce the heat, cover and let simmer until the liquid is absorbed and the rice is cooked (about 25-30 minutes). 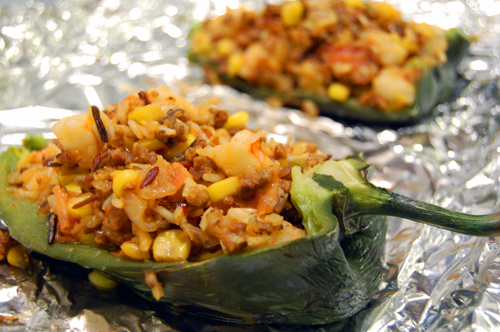 While the rice is cooking, place the chiles on a baking sheet and bake at 400F until soft (about 15 minutes). Once the chiles are soft, cut each in half, remove the seeds and ribs, and set aside. Once the rice is done, add the shrimp and tomatoes to the mixture, turn the heat to medium and sauté until shrimp is cooked (about 3-5 minutes). Stuff each chile with the rice mixture, top with cheddar and pepper-jack cheese, and place back into the oven and turn on the broiler. Broil until cheese begins to turn golden (about 3-5 minutes). I saw shrimp and ran over 🙂 it looks so good and yummy! Love the ingredients! These look so good. SO good. I buzzed them! That looks really awesome! Thank you for sharing this! Looks fabulous! Guy is a little wacky but he makes some great stuff! I love Diners, Drive-Ins and Dives. There are fewer things of greater beauty than a chili filled with stuff. Stuffed veggies always look so fancy. Your filling sounds really good and the guacamole on the side is perfect. Those look incredible. I’ve made something similar with chicken, but I love the shrimp chorizo combo! 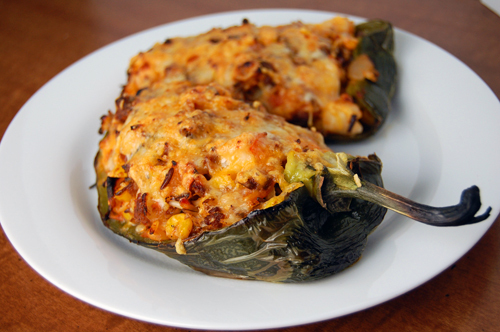 These stuffed peppers sound so flavorful and look terrific! Good luck with the contest! I need to try this! 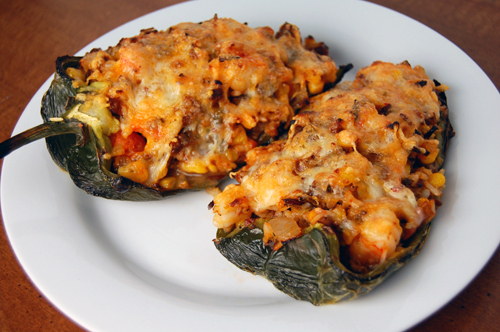 the more and more I see stuffed poblanos the more I say I need to try this! I love your stuffing! Being portuguese, I grew up with chorizo and am always looking for more way to use it! This is perfect! BUZZED! Wow this meal looks amazing! I love all the flavors too. YUM! Oh my goodness, I am going to need to make these ASAP! This is definitely the recipe to try. And I feel the same way I love chorizo! Absolutely buzzworthy! Awesome idea! Creative and Delish! Thanks for This Post! I love stuffed peppers..they looks awesome, and photos are beautiful! OH MAN this dish is basically everything I love about food. You have been buzzed! this sounds outrageously delicious. i have a soft spot for spice and cheese and then you throw in shrimp and chorizo and i fell in love.